Labor Day weekend is your last opportunity for an epic summer ride. For the average vacationer, life on the road means nothing more than winding blacktops and less-than-desirable rest stops. But for you, the great American highway is a splendor of seemingly untrodden yet rugged tarmac complete with thrillling twisties, vistas and turnouts. Whether it's a white-knuckle mountain journey, a precipitous coastal byway or time-honored interstate, immerse yourself in sheer beauty of the open road and wrap up the season with a legendary weekend ride. Southwesterners seeking reprieve from the summer heat will find an unexpected haven located high above the arid Tucson, Arizona, desert. Mount Lemmon Ski Valley, the nation's southernmost ski destination, is a pine-covered oasis for sun-drenched city dwellers. The scenic 24-mile climb takes riders from 2,400 feet at the base of the mountain and to the summit at 8,000 feet. Along the curvy ride you'll discover a wealth of diverse scenic overlooks that range from desert vegetation to lush greenery. Climate change and scenery are so disparate, it'll feel like you're traveling through all four seasons between the trailhead and the summit. Ride On: Your friends won't believe the vast terrain located in the heart of the desert. Don't forget your helmet Go Pro—you'll want to document this ride as proof you were there. Move over, Mount Rushmore. The historic landmark has little on the picturesque scenery found along South Dakota's Needles Highway. At the heart of the Black Hills scenic byways, Needles Highway consists of 14 impressive miles complete with sharp turns, narrow tunnels and daring switchbacks. A true bikers paradise, riders will find remarkable granite spires that give a preview of the panoramas that lie ahead. With close proximity to Sturgis, you'll be in biker-friendly territory, but those are the only locals you'll run into. Situated within the 73,000 acre Custer State Park, don't be surprised to see resident bison, deer and antelope along the way. "Needles Eye Tunnel" by Little Mountain 5 - Own work. Licensed under CC BY-SA 3.0 via Wikimedia Commons. Ride On: Make time to take in the sights. From mile-high vistas and striking foliage, pack a picnic lunch and bring your hiking gear so you can do some on-foot exploration. Named one of the world's most spectacular trips in National Geographic's "Drives of a Lifetime," the Cherohala Skyway connects Tellico Plains, Tennessee, to Robbinsville, North Carolina. The lesser-known trail provides an uncrowded alternative to North Carolina's popular Tail of the Dragon route at Deal's Gap. Cooler summer temps and sweeping turns set the stage as you cross through parts of the 640,000-acre Cherokee National Forest. Ride On: Even if your navigation skills are top-notch, download a GPS app to your iPhone to ensure safer travels. One of the nation's most iconic drives, the famed Pacific Coast Highway runs from Southern California's Orange County to Northern California's Mendocino County. The coastline-hugging Highway 1 is a known bucket-list favorite due to its endless seascape and natural beauty. Even if you've experienced the splendor of PCH, as one of the most breathtaking rides in the world, there's always something new to discover. The most famous Big Sur stretch between San Simeon and Carmel can get especially crowded, so beat the rush by planning ahead. "Bixby Creek Bridge, The Big Sur, California" by ian mcwilliams - originally posted to Flickr as Bixby Creek Bridge, The Big Sur, California. Licensed under CC BY 2.0 via Wikimedia Commons. 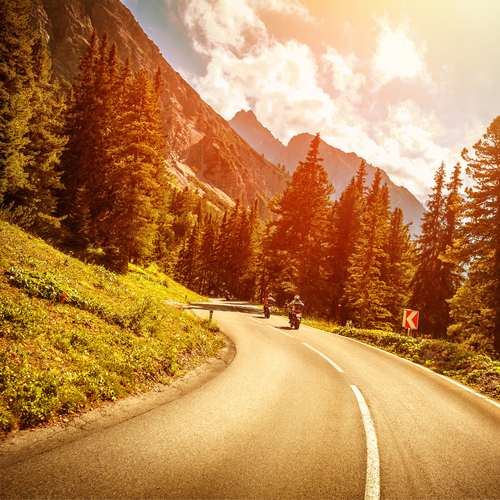 Ride on: The majestic scenery is a proven catalyst for accidents. Keep your eyes on the road then take a break by pitching a tent at one of the many beach-side campgrounds along the way.